Recommended? Not for what it’s got to say about the world, no. 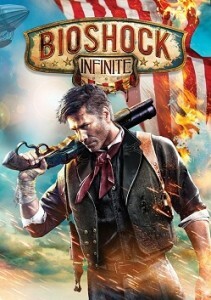 I’m not too much one for first-person shooters but I’m an anarchist and I’m into steampunk and videogames so it was pretty much inevitable that I was going to give BioShock: Infinite a try. This game is completely full of class war and anti-racist tropes. I mean, like, completely full. So full it’s overflowing and honestly the tropes are starting to smell and shouldn’t someone clean this thing out before they start to rot? In BioShock: Infinite you play a disinterested white savior with the higher moral ground who runs around killing first racists and then the anti-racist revolutionaries. The moral of the story is that anyone who wants to solve problems like institutionalized racism and classism with revolutionary violence is a bad person who is going to take things too far. Unless you’re the protagonist, an ex-Pinkerton agent who kills hundreds of people over the course of the game in the name of a paycheck. In which case, you’re in a good place to judge. You play a white guy ex-Pinkerton sent to rescue/kidnap a girl from a tower. In proper “we’re not sexist, this is the 21st-century” style, the girl is reasonably competent at playing a supporting role and even has her own feelings, which of course you largely disregard. The tower is in a white-supremacist floating steampunk city that worships the founding fathers of the US like gods and has seceded from that godless nation. Black people work 16-hour days and live on the ground and/or underground, ala Metropolis, for a Henry Clay Frick knockoff called Fink. It does a pretty good job of poking fun at racism and a pretty good job of tying racism into classism, which I can appreciate. It also makes sure to beat it into our heads that the Irish aren’t white either, which of course is necessary because there’s no way a white player could otherwise identify with black oppression. Anyhow, the insurgents are called “anarchists” in all the anti-insurgent propaganda. You see, back in the day, the government used the word “anarchist” where it now uses “terrorist.” I’m pretty sure the writers thought they were being edgy and period-appropriate but it reads to me like just another way of maybe making a statement about modern war-on-terror propaganda. Which is an okay thing to do. When you finally meet these “anarchists,” they’re led by a black woman who used to be the cult leader’s maid. She tasks you to getting her some guns for the revolution. So far, so good. I mean, they’re not anarchists, they’re generic probably-leftist revolutionaries, but whatever. I’m happy to get them some guns. And then you find out that she’s planning on using the guns against the racists and that’s when your character puts his foot down. Oh no, you who live like slaves, you can’t go around killing your oppressors. Also, your character decides the revolutionaries have crossed the line even before you see them do things that, well, are probably crossing the line, Nat Turner style. Anyhow, then the game switches tone drastically and now you’re killing as many “anarchists” as you are racists. Then you run around and kill more people and eventually the game ends in this way I actually don’t want to spoil that is fairly impressive for a video game but would be pretty cliche in a movie and damn-near-unforgivable in a book. I like the Les Mis reference, and the aesthetics of the game are beautiful. But the class struggle backdrop is about as generic of a misunderstanding of turn-of-the-century class struggle as it gets. The system is bad! The revolutionaries are bad! The lesson? Don’t do anything. That’s the lesson of this game. Don’t do anything. Take it from a kicked-out-of-the-Pinkertons mercenary—just stay home. Or rescue a princess from the tower, whatever. It’s fun to play a pretty game where you run around and shoot people though. Don’t get me wrong.